Ten Years – Time Flies! That’s right! 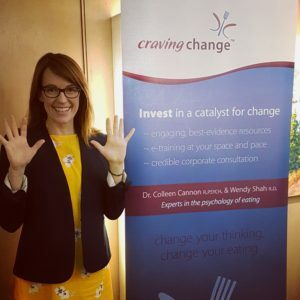 Craving Change Inc. has been providing clinicians with resources and training in the cognitive-behavioural model for problematic eating for ten years. Colleen and Wendy have had the pleasure of sharing their program with dietitians, nurses, social workers, psychologists, physicians, kinesiologists and pharmacists from every province and territory in Canada as well as other countries. It has been tremendously rewarding to know that Craving Change has made a difference in their colleagues’ practices and in their clients’ lives. Here’s to another ten years!